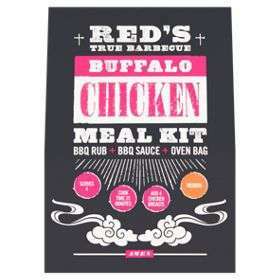 Yeh, "Buffalo", "Hot Wings" etc. Is this the same as buffalo wings? I think the Frank's is a bit too, "hot pepper" like, this stuff and the Aldi tone it down a bit with the pineapple. 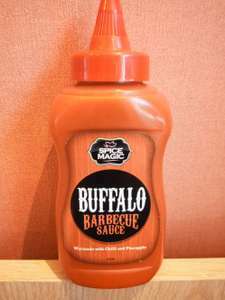 Just picked one up in multiple local b&amp;m. It will be the first the ive tried the hot buffalo version so fingers crossed it's not too hot. I put the original red hot sauce on everything from pizza to scrambled eggs. I scanned it using the barcode scanner built into the B&amp;M app and it came up with this price, which is what they charged at the till. Can't see it in the app? Expired unless I'm missing something. Green one in S is still a reasonable £6.70ish, but all the others look like normal prices. 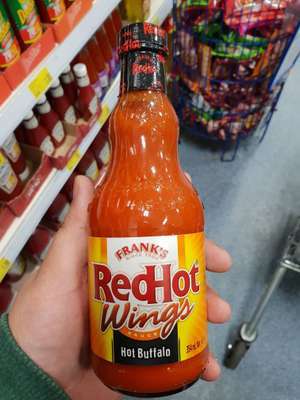 Hot hot hot  Franks Red Hot Buffalo sauce is only 25p after redeeming on Clicksnap! Get those chicken wings ready! For those that don't know! They are only offering the 75p cashback at Asda now. Add some cayenne pepper and chilli flakes (bit of butter and into a pan to simmer, then cover some chicken wings) gives a solid kick, so much that my siblings struggle the amateurs! This sauce is not hot in the least. Waste of money if you ask me. I've got two of the 2-bay 6TB variety, bought within months of each other, and there is a different, clunky, interface to each. That's not to say they don't work for what I want, they do, but the WDMyCloud is a lot more straight forward if all you want is some extra storage that is available to various devices on your network - that is the advantage over a simple HDD. If all you need is basic extra storage for one computer, then an external HDD will be cheaper and straight-forward. If you want network access, and don't need the bells and whistles of RAID back-up, then a single drive NAS like this is what you want. If you do want to have the peace of mind that RAID back-ups might provide, then a multi drive NAS or a server is the way to go. Personally I mirror data on external HDDs and store them at a different location, and use the servers, NASs, cloud drive and multiple HDDs for my day to day data storage. As an aside, the 2-bay versions of this (and the WDMyCloud) have USB ports at the back for daisy chaining additional drives to, so this is a useful way of adding extra storage if you have limited USB ports on your computer - I've got 6TB externals on both of the 2-bay Buffalos and a 3TB portable drive tacked to the WDMyCloud. Got one of these. There's no wifi so it has to sit near your router. I use it to back up my various computers to, via Time Machine (Macs) or AOMEI Backupper and FreeFileSync (Windows). Since it's already duplicating the computers, it doesn't need its own redundancy. While the interface certainly isn't slick, it works well once set up. Before people start the criticism, I also do periodic backups to a pocket drive that lives at a friend's house. I didn't say that it is pointless, I said that it is "almost" pointless. if you decide to spend a decent amount of cash on one then the least it can do is provide 2 drives mirroring each other so that if one drive dies then you still have the other one. All you need to do then is replace the faulty drive. Otherwise it's just a fancy hard drive. I suppose if you already have dual/3/4 drive NAS in your network and you just want to add some additional disc space but with the extra functionality of a NAS then why not. Otherwise I can't see the point. My experience of bufferlo nas's thus far has been whilst the hardware tends to work the software is rather terrible, it's slow un-inuntative and doesn't seem to get updated very often. Thanks - so something like this https://www.hotukdeals.com/deals/synology-diskstation-ds218j8tb-iw-entry-level-2-bay-8tb2x4tb-seagate-ironwolf-nas-for-home-and-personal-cloud-storage-36747-del-box-3121502 and install the free version of plex would do for my (probably basic) needs I.e. easy backup of photos/playback of home video clips/ripped DVDs/music etc? Can anyone recommend a reliable but fairly straightforward NAS to setup? I have never had one before, am complete novice but like the thought of auto backup photos from phone. And is it possible to store DVDS on NAS to stream to smart tv? 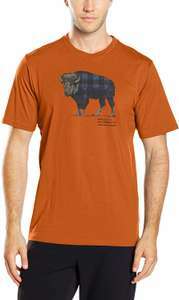 Buffalo 3.6 out of 5 stars 58 Reviews Buffalo LS210D0201-EU 2TB (1 x 2TB) LinkStation 210 1 Bay Desktop NAS Considering the price of Cloud storage this isn’t bad. Thanks Damian, I can’t open that kellkoo link btw. I think I would prefer a NAS rather than an external USB drive as already have one, I like the idea of auto backup from mobile phones. Any deals you would recommend at the moment? Looking for between 2tb - 4tb. Extra tenner for the 3gb. Might pass though as someone mentioned high pitched noise...my current one does that! They are a nightmare, the software was written in the 16th Century keeps losing log in, and randomly lets guests in.. I've had a couple of these used as network drives and for back ups. Had no trouble with them at all. Can't comment on connecting them to the internet. But they work fine for NAS. Had the 2 bay LS220 for around a year before it failed and toasted one of the HDDs. NAS unit was totally kaput. Managed to save the second drive but not any data. Found it OK in terms of accessing data in the home network and acceptable away from home. The android app was quite limited. Data transfer was very slow over GB ethernet. I've moved away from NAS setups now and just use a networked PC with a sh!t-load of HDDs inside (Dell T20). Much better for my home setup (mobiles, laptop, TV) to access as it's easier to manage and access stuff through Windoze than it was with the quirky Buffalo NAS. IIRC the Buffalo formats HDDs in some different-to-the-norm filesystem which may make it more/unnecessarily difficult to quickly recover data WHEN the NAS fails. I say "WHEN" because my experience of the LS220 NAS is not, on the whole, a positive one. It's got to be 3 or 4 years ago I had the LS220 so, unless they've updated HW/SW, then this will be a relatively old unit. I really can't see much of a use for this now: there are other better all-round options for what is, effectively, an expansion box that houses a HDD or 2. If I were to start again then I wouldn't go down the NAS route at all. My 3TB failed after 7 months when my son nudged it and it dropped from vertical standing position to its side- that was literally it! I know as I was watching it happen:) I have been really gutted to find it does not work after such minor incident... it’s almost like there is no protection for HDD inside- no rubber mounts or anything like that which explains why drive is so loud at times:/ So yeah, if you are prepared to store it’s somewhere very safe where there is no chance any one will have a chance to even touch it then go go it:) I am sure it will last into 2 years and more:) Ordered replacement and got original partially refunded by eBuyer which was huge disappointment on its own. I paid £75 for 3TB - got refunded £63 on the basis its more than 6 months old or other gibberish...not happy even though I could have buy 3TB again for £65 of eBuyer as need two of those for 2 different xboxes... I think I won’t be buying from them anymore as their return policy is a joke! My money will go somewhere else even though it’s a good price and decent drive (disregarding small accident!). Anyone know how these compare to WD reliability wise? Can highly recommend a visit to the cathedral and a spot of lunch at Zizzi if you're visiting. Worth coming from Russia for these offers. The bargains only pop up every once in a while, but always worth a peep. Oh nice find, I wish my Waitrose did this. Nipped in for some eggs and found a couple of offers on meat  steaks down from £5 to £1.50 this was in Nottingham maybe be all stores depending on stock?? I meant that I want to use it like a proper NAS drive... Is this possible? If so, how? Hardware encryption. Grrrr. Pain in the neck. If the controller goes faulty you've no chance of recovering your data by sticking the drive on a different controller. It will be usb 3, probably 5400 RPM. I have a 4TB external and it reads and writes at 155 MB/s, which is quite fast! That reminds me I've got a 20% off code to use at Western digital. I can get a 4 TB for £68. Low stock at £45 now - bought myself one and this cheaper one to see which one I prefer in person. An outrageous bargain! Well done. Thanks op Bought the larger one for 15 inch laptop arrived today , bargain as it did go down to £48! Definitely 36cm width. Fits a 13" laptop comfortably. Can anyone who bought confirm the dimensions. This one says H28.00cm x W26.00cm x D10.00cm, though there's one in a different colour but same bag that says H28.00cm x W36.00cm x D10.00cm. Probably a typo but I was wondering if the width is 26cm or 36 cm?